Should We All Go Gluten Free? Gluten is one of the most popular proteins on earth, and one that we humans have been eating for thousands of years. So how can something so ingrained in our diet be so evil? Ever since the release of David Perlmutter’s book, Grain Brain: The Surprising Truth About Wheat, Carbs and Sugar, and others like it such as William Davis’ Wheat Belly, fear mongering over the perils of consuming gluten have reached a crescendo. So what exactly is gluten? Although gluten is sometimes defined as being strictly specific to wheat, it is often said to be part of other cereal grains — including rye, barley and various crossbreeds — since these grains also contain protein composites made from prolamins and glutelins. For people with coeliac disease, gluten is a serious problem, and gluten free dieting is 100% necessary. Coeliac disease is a genetic condition that affects both genders, and people of all ages, and involves the immune system reacting abnormally to gluten, and in turn, causes damage to their small bowel. According to Coeliac Australia it is a disease that now affects up to 1 in 70 Australians; meaning that more than 300,000 Aussies currently live with this life altering disease. In Grain Brain, David Perlmutter, a neurologist by trade, states that gluten, “represents one of the greatest and most under-recognized health threats to humanity.” And according to Perlmutter our over consumption of wheat is the lead cause of dementia, decreased libido, depression, chronic headaches, anxiety, epilepsy, and ADHD. This is obviously an outlandish claim, and one that’s clearly based on bias towards a certain kind of diet. 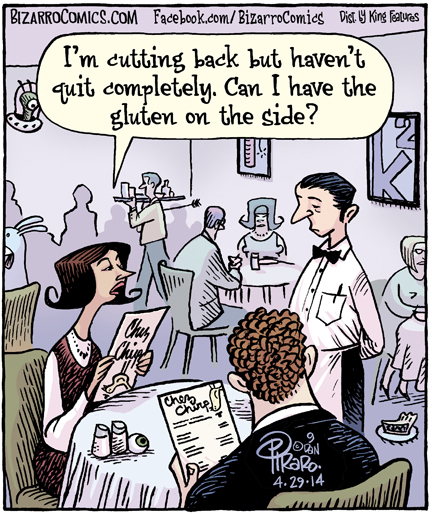 While the recent popularity of the gluten free diet has certainly been influenced by a rise in gluten allergy – with coeliac disease being four times as common as it was 50 years ago according to recent research published in the the journal Gastroenterology – make no mistakes about it, gluten-free dieting is a trend. For anyone who isn’t coeliac: eat bread! eat pasta! And avoid too much fat! Of course we all need to monitor our carb consumption and avoid stuffing our faces full of grains, but is adopting a paleo diet – as prescribed by Perlmutter – really the golden bullet? The ultimate cure to all of humanities health maladies? I think not. Bread Wars: Which Bread Is Best? © 2019 Glenroy Bakery. All Rights Reserved.